Farm animals live, eat and go to the bathroom in the same relatively small amount of space. A sick animal or one who is carrying some type of bacteria or disease can cause disease to spread if the conditions are right. In most cases, animals such as pigs and chickens are unlikely to share illnesses. For the most part, chickens and pigs are simply too biologically diverse to share very many diseases. For example, your pigs are highly unlikely to contract Avian Influenza or any other bird-specific disease as a result of spending a significant of time sharing space with your chickens. 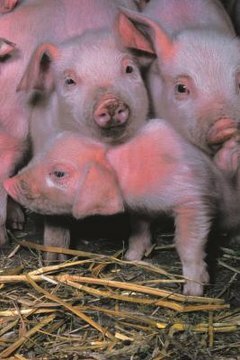 As a whole, the majority of illnesses that affect poultry are harmless to pigs and the same is true for pig sicknesses affecting your chickens. Chickens, like many birds, can carry an assortment of diseases that can be transmissible to other animals. It is very common for chickens to carry salmonella either on their bodies or in their intestines. Chicken feces may very well contain bacteria that can cause problems for other animals, such as pigs and even humans, if it is ingested or enters an open wound. Pigs are omnivores. They eat just about everything, including fruit, vegetables, animal matter, eggs and have even been known to scavenge dead animals. If your chicken is sick and your pig consumes the bacteria, then there is a good chance your pig may also become sick. If your chicken lives within the same general area as your pig, then it is possible your pig may become ill from eating items your chicken has pooped on, from eating the chicken poop directly or even eating eggs or deceased birds. If you keep your chickens in a coop or enclosure where they do not have access to your pig's living environment, your pig is unlikely to catch any type of illness from your chickens. Always make sure to quarantine sick animals in a location separate from other animals. Keep your animal's living enclosures as clean as possible. Make sure to sterilize your animal's living areas regularly to prevent disease or bacteria from becoming a substantial problem. Dispose of any dead animals appropriately. Always make sure to wash your hands thoroughly after handling your chickens. HenCam: Do Chickens Transmit Diseases to People?